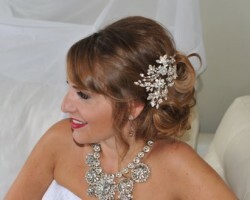 Since 1999, Jennifer of JP Makeup Artist has been specializing in bridal and special occasion makeup. This artist works to make sure that she is up to date on all of the latest styles and trends while also maintaining a classic and romantic feel to all of the looks that she applies. The goal of this professional is to make your inner confidence and beauty shine through rather than cake on makeup that makes you unrecognizable and hides your natural features. Patty Bell Makeup has been offering her talents in commercial, print and bridal makeup in Pittsburgh for many years. Patty is most well known and respected for her flexibility. She is able to achieve any look or style you want with flawlessly precious and great attention to detail. According to reviews, one of the best things about working with this artist is that her personality will put you at ease as she works. This is incredibly important on a day as important as your wedding. Classic Hair and Makeup offers onsite options for all of their services or you can come to the salon to have your makeup done. The options include completely customized full face application, airbrush foundation, false eyelashes or fantasy makeup. You can ask for a combination of services to be sure that you have the look you have always wanted for your wedding day. These Pittsburgh makeup artists are able to achieve any style you could possibly want and they do it all at affordable prices too. Bongiorno, Bella! is a company that is specifically focused on providing the highest quality wedding hair and makeup in Pennsylvania. Since becoming a licensed cosmetologist in 2007, the owner and operator of the company, Phylicia, has been focused on making women feel empowered and look beautiful. This expert has the necessary experience to accommodate for special requests and styles so you can be sure that she will help you achieve a dreamy bridal look. It will even feel like permanent makeup as it lasts throughout the entire celebration. Hannah B. Donovan is a freelance makeup artist in Pittsburgh, PA that has extensive experience working in commercial makeup, print looks and bridal styles too. Hannah’s experience has allowed her the chance to work and hone her skills for all skin tones, age groups and face shapes. This means that Hannah is better able to achieve the style that you want for your wedding in a way that will truly complement your natural beauty. You will love the results on the day and when you see the look in pictures afterwards.